Mercedes-Benz Launches New Brand Claim "The Best or Nothing"
Mercedes-Benz has been having a pretty successful 2010 so far, with worldwide sales up 16% from the same period in 2009. In June 2010, the company launched its new brand claim “The Best or Nothing” which is now appearing in print, tv and online campaigns. While this new brand claim has only recently been made public as a marketing tool, the motto was originally adopted by the founder of Mercedes-Benz, Gottlieb Daimler. It is this principle that Daimler developed the Mercedes-Benz product under, and expects each employee to live by. 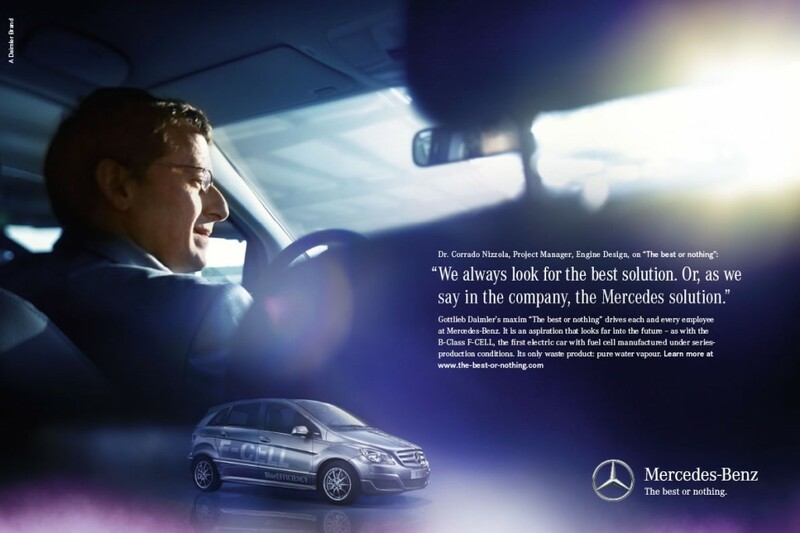 Another interesting aspect of this new Mercedes-Benz branding is that high-ranking members of the Mercedes-Benz staff are being featured as brand ambassadors in each element of the campaign. This not only adds a personal touch to the message, but also displays the company’s ambition to lead the auto manufacturer industry now and in the future by presenting the variety of specialists and engineers working on innovative energy efficient solutions.